The jobs-to-employed-resident (J/ER) ratio is 0.80, meaning that San José has 0.80 jobs per employed resident. In contrast, Palo Alto has 3.29 and Mountain View has 1.92 jobs per employed resident. San José’s low J/ER ratio plays a large role in contributing to the City’s poor fiscal health and heavy traffic. 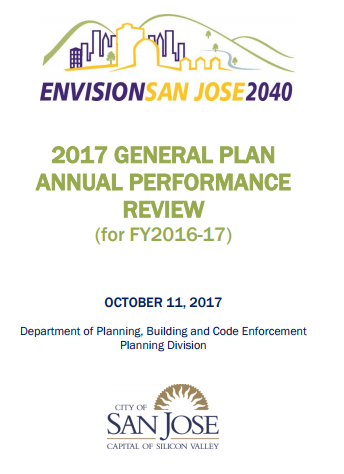 San José has approved 10 Urban Village Plans, including three recently approved this year. Six plans are currently under development by the Urban Village Team in the Planning Division. There are 342 miles of bikeways within San José: 285 miles of on-street bikeways and 57 miles of off-street trails. Office vacancies in downtown San José are down to 11%, from 23.6% in 2011. San José has 200 park sites totaling over 3,500 acres of parkland.